It isn’t a new framework or technology. It is a set of best practices to make a web application function similar to a desktop or mobile application. The dream is to have an experience so uniform and seamless that the user is unable to tell the difference between a PWA and a native mobile app. PWAs deliver user experiences through progressive enhancement. It essentially means that a PWA will perform the same functions on a new iPhone 8 as it would on an older generation iPhone. Some features may not be available, but the app continues to work and perform as it should. Feel like a natural app on the device, with an immersive experience. PWAs are instantly installed live on the user’s home screen, without the need for an app store. They offer an immersive full screen experience. The retail customer journey is getting increasingly complex. It is multi-channelled across multiple devices. Customer expectations on mobile have also been shaped by fast and engaging native app experiences like Facebook, Uber, and Amazon. Mobile shoppers are constantly bombarded with interruptions – whether it’s a text, a news alert, catching a train, or one of a million other disruptions. If shoppers aren’t able to complete a purchase before they’re interrupted, you lose them – maybe forever. Hence the lower conversation rate for mobile compared to desktops. 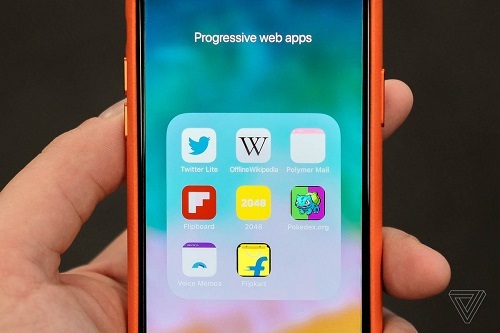 Originally proposed by Google in 2015, the company been busy in the PWA front, helping developers provide native-app qualities in web applications that are reliable, fast, and engaging. Google has shown the relative ease of development. Google has also provided courses aimed at developers showing how to convert web pages to PWAs. According to Salesforce, it typically takes over 6 months to build a PWA from scratch. However with o,ur platform at The App Office any small business or organisation can literally build one in days. The Microsoft Store contains “PWAs” packaged for Windows 10, but does not appear to contain links to actual on-line PWAs. It’s not clear that it can list web apps separate from Windows apps. Traditionally, business owners, product owners and retail professionals has been faced with a dilemma. More engaging user experience of a native mobile app versus the much broader reach of the mobile web. The arrival of PWAs should now bridge that gap. PWAs should enable retailers and organisations to deliver the fast experience of a native app to a much larger audience on the web. PWAs are expected to become the gold standard for mobile design. But dont despair you can incorproate your new responsive website into our PWA builder but add those extra features and funtions your website does not offer.